The 2019 World Cup is two years away. But if you want to see the winners in action, and you can find tickets, just be at the MCA Stadium in Pune this Sunday. Yes, I am talking about India, and no, you cannot have whatever I am smoking. Virat Kohli’s India has been on a majestic romp in the Test arena over the past few months. First South Africa, then New Zealand and most recently Cook’s much vaunted English team have all been crushed under the juggernaut. Steve Smith’s Australia, notwithstanding the clinical dismemberment of Pakistan, knows that come February they will be playing a whole different ball game in beautiful winter conditions in India. But the result may not be quite so pretty. This is the one day game, and India is not the number one side in the world. Not even number two. So why do I think the world’s number three side as of 31st Dec 2016, behind Australia and South Africa, will win the World Cup in 2019? I believe this will happen because all the pieces of the puzzle have started coming together for India in the recent past. MS Dhoni suddenly resigned as captain two weeks before the much-anticipated start of the ODI season in India, and a few months before India travels to England for the Champions Trophy. This is a hugely positive and potentially game-changing move for India. As much as Gary Kirsten and other people I respect in the cricketing world have been bemoaning Dhoni’s resignation, the fact is that Dhoni had become ineffective as captain after bearing the tremendous burden that weighs on any Indian captain, for so many years. His natural aggression as a batsman and a cricketer had been stifled by the relentless pressure. The negative impact of father time was visible every time he attempted to match up to his well-earned reputation as the world’s best finisher. He now leaves the stress of captaincy on and off the field to Virat Kohli and gets back to being India’s best wicketkeeper-batsman of all time. India’s wicket keeping cupboard, while not bare, is not overflowing either. And while talented youngsters like Rishabh Pant come up through the ranks, Dhoni, who has improved beyond recognition as a wicket-keeper since he came on the scene with shoulder length locks, will display his genius behind the stumps. Equally importantly, Dhoni will move up the batting order and provide stability and aggression to a batting line-up that no bowler in the world will want to run in at. Lokesh Rahul and Shikhar Dhawan will in all likelihood open the innings. Rahul after three ODIs has an average of 196 and a strike rate of 83.40. Shikhar, has an average of 44 and strike rate of 90. When Shikhar is on song and in the mood, there are few more destructive and beautiful left handers in the world at the top of the innings. Rahul is currently at the top of his game, and in that rare zone where batsmen in-form love to be every time they walk out to open the innings. In the event that Dhawan’s knock of 63 in 84 balls in the warm-up match at the Brabourne Stadium in Mumbai this week is not good enough to put him in the XI, Ajinkya Rahane, with an average of 33 and a strike rate of 79 will in all likelihood open the batting. One of the two best batsmen in limited overs cricket today, Virat Kohli, will come in at number three, wielding a willow that delivers an average of 53 at a strike rate over 90. You could go on about the genius of this man, but we are privileged to watch him at the top of his game currently, so I shall desist from waxing lyrical about him, just this once. And Kohli will, in all likelihood, be followed by MS Dhoni boasting an average of 51 and a strike rate of 89. What should be of the utmost concern to the opposition, is that at number four, Dhoni will get an opportunity to build a big innings after settling down and letting his ageing eyes and reactions adjust to the conditions. And as we all know, and which the hapless Chris Woakes and England received a reminder of this week in Mumbai, when MS Dhoni gets going, there is no bowling attack that can stop him. And if within the 50 overs an opposition does manage to get past Kohli and Dhoni, a rejuvenated Yuvraj Singh will take his place in the middle. At the age of 35, with the kind of batting talent India has at its disposal, if Yuvraj is back in the team, and you can be sure that he deserves to be, as he proved in the gem of an innings that he played in Mumbai this week scoring 56 and appearing in delectable form, other teams will be in trouble. While his average of 36 may not be the best in the business today, he has earned it over 293 ODIzs over a 14 year period, and in the last 10 overs of an ODI, with a well set Dhoni and Yuvraj at the crease, the opposition had better make sure their chaplain is not too far away. The number six position will be a toss-up between two extremely talented batsmen – Kedar Jadhav with an average of 47 and a strike rate of 105 and Manish Pandey with an average of 43 and a strike rate of 96. With Yuvraj unlikely to play on until the World Cup, both these men will be playing in the same XI, sooner or later. At number seven will be the best all-rounder in world cricket today, Ravichandran Ashwin. While Ashwin has not been anywhere as dominating in the limited overs format as he has been in Test cricket, he has improved beyond measure both as a batsman and a bowler over the past year or so. Ashwin will be followed by the man who has improved as a batsman quite remarkably over the past year and has at the same time emerged as the most impactful spinner on Indian pitches in a long time – Ravindra Jadeja, the man who wields his bat like a sword every time he scores a 50. With Ashwin, Jadeja and Yuvraj in the team and Kedar Jadhav coming in to bowl his spin as well, there is no room for another spinner. The last three slots will, therefore, most likely go to pacemen – Hardik Pandya (another all-rounder who is showing some serious potential in the limited overs format), Bhuvaneshwar Kumar, and the supremely talented Jasprit Bumrah, who, after a short 8 ODI career thus far, has taken 17 wickets at an average of 14.64. With possibly Ajinkya Rahane, Umesh Yadav and one of either Kedar Jadhav or Manish Pandey left to cool their heels in the dressing room, and with the injured Rohit Sharma and Mohammed Shami available in the future, India is truly spoilt for choice in cricketing talent. 2019 is indeed two years away, and a lot can happen between now and then, but Virat Kohli is a man who likes to take baby steps as he builds up India into the best team in the world across all formats. 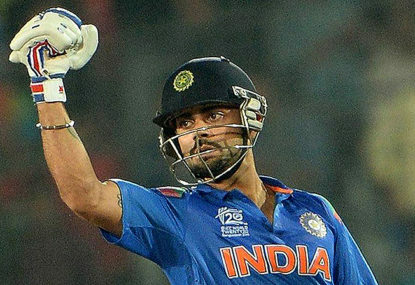 With the Champions Trophy in England coming up in six months, Kohli will be focusing on building up the best batting and bowling combinations that he can muster. His sights will undoubtedly be on lifting the Champions Trophy and then the World Cup in 2019. Decimating Eoin Morgan’s England starting this Sunday at Pune is just another baby step to be taken on the path to greater glory.